Chelsea Terrace includes three buildings at 5895, 5897, 5899 Kincaid Street on a beautifully-landscaped property in Burnaby. Completed in 1978, it is the New Chelsea Society’s largest housing complex, including several one-bedroom suites for disabled residents. 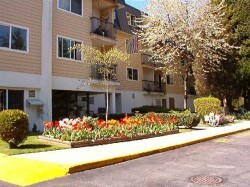 With large lawns and lush trees around Chelsea Terrace, residents have easy access to pleasant walks. Amenities in the building include two coffee shop lounges and other meeting spaces to encourage an active social life. Building A. 65 bachelor suites, 8 one-bedroom suites for married couples (including 3 bachelor suites and 4 one-bedroom suites for disabled residents); Building B. 62 bachelor suites for single residents; Building C. 64 bachelor suites. Library lounges with pianos, pool tables and fireplaces. Active tenants committee organizing social activities for residents. Two coffee shop lounges with full kitchen facilities.